Hear about what Magritek customers have to say about their Spinsolve. The relaxometry technique in particular is very fast and can be used very easily in the laboratory to get information about our materials. This means we can develop quick and low cost measurements for control of materials going into processes. It is low cost, but also powerful and so far has allowed us to do many of the experiments we need to do. So if need be we can also do quick spectroscopy experiments. However, it is the Expert software that allows most of the real user flexibility. The continuing development of this software by Magritek helps us make the most of the machine in our very non-standard applications. We had the privilege to acquire in 2015 the first Magritek Spinsolve with a gradient coil. Since then, our experience with the Spinsolve has been extremely exciting and rewarding. The great performance of the hardware, in terms of stability and robustness, has made it possible to implement challenging NMR experiments such as multi-pulse solvent suppression methods, and ultrafast 2D NMR –probably one of the most hardware-demanding NMR experiments. We are applying these innovative methods in various fields, from the real-time and online monitoring of chemical reactions to the high-throughput screening of food matrices. I can confidently say that the Spinsolve has opened new research avenues in our lab, as well as new collaboration perspectives. 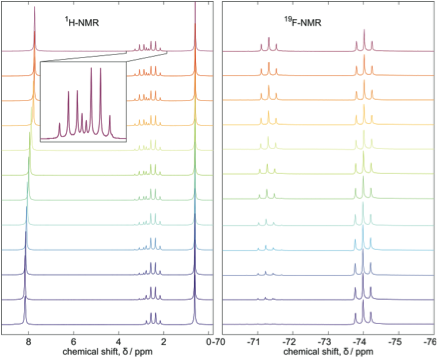 1H and 19F NMR single scan spectra from an esterification of 2,2,2-trifluoroethanol to 2,2,2-trifluorethyl acetate with acetic acid. 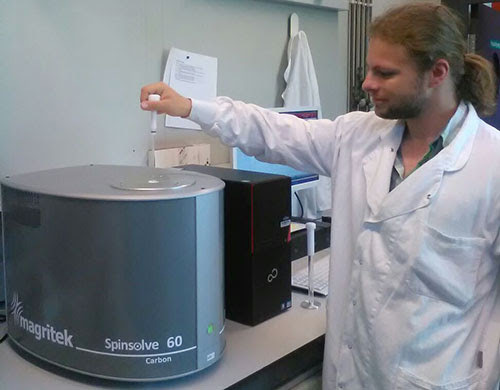 Flow-through reaction monitoring set up on the Magritek Spinsolve Benchtop NMR spectrometer at BAM in Berlin. In order to identify components in medicinal products, selective analytical methods are required. NMR spectroscopy is such a technique. Furthermore, NMR spectroscopy offers a direct way to quantify any of the components encountered without the need of a reference standard. Historically we have used and will continue to use high field NMR spectroscopy, various forms of vibration spectroscopy as well as mass spectrometry coupled to chromatographic systems. Dr Keizers comments on the benefits of their using the Spinsolve 60. The fast processing time, easy operation and shimming in a robust instrument means that I can feel comfortable with students using. I shopped around quite a bit for an NMR to meet our needs – primarily teaching. The Magritek system is a great space saver (table top) and does not require cryogen so upkeep costs of the instrument are very low. The most common student mistake would be to break a tube off inside the instrument. Fixing this does not require a service technician visit, but rather can be easily removed by the user. I love the simplicity of its design. NMR provides detailed structure of the molecule within a very short time compared to the other instruments. The students feel very confident and satisfied with their laboratory accomplishments using the Spinsolve. We incorporate all the available instruments in instrumental analysis and advanced inorganic chemistry classes for students’ benefit. 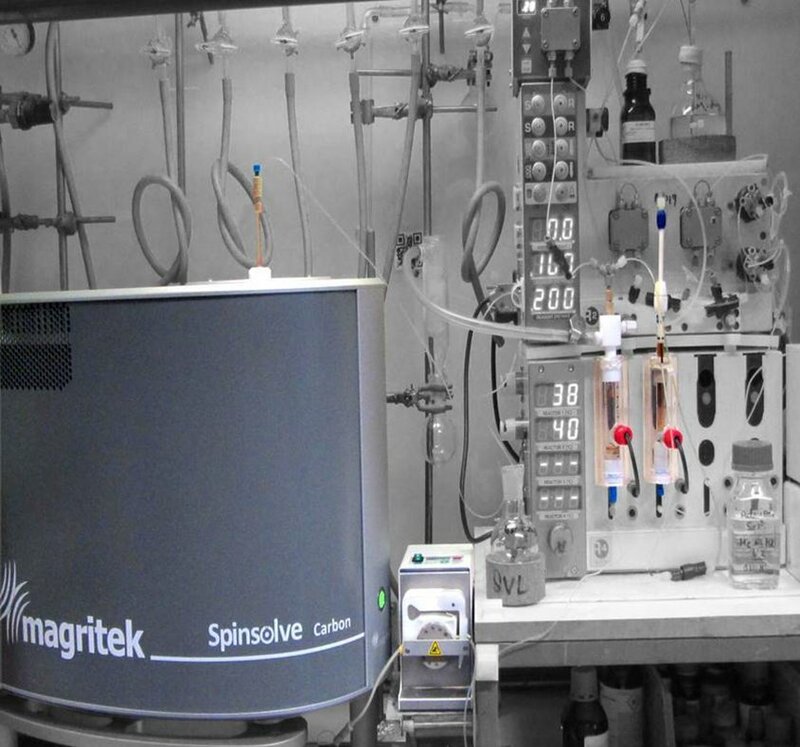 Since spring 2017, several applications of Spinsolve were utilized to analyze paramagnetic and organometallic compounds. Such is the delight to have the Spinsolve at Lyon, we are also in the process of seeking funds for the purchase of the 13C console of Spinsolve. Dr Stanislav Presolski is an assistant professor in chemistry at Yale-NUS. While in research, his goals are to harness his synthetic and physical-organic chemistry experience in leading a research group of undergraduates, who will design, prepare and deploy operationally simple, photo-switchable catalytic molecules, it is in the area of teaching techniques to students where he is taking a fresh approach. We have designed our science classes in a way that makes them fairly indistinguishable from actual research. Dr Presolski’s classes are quite small – fewer than 18 students per class. 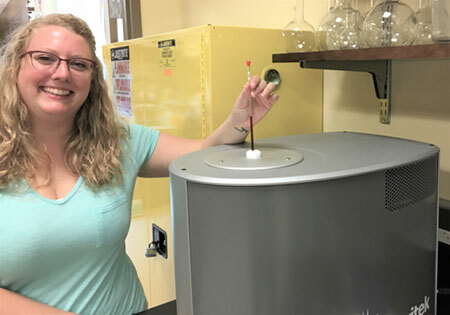 This means that professors are able to give tailored instruction to their students and provide the key skills needed to properly use the scientific equipment. Now all students run their own NMR spectra. They mainly run 1H spectra from their synthesis products. If they are interested, they can also run other spectra (13C and 2D-experiments). Our motivation for using Magritek Spinsolve is to teach our students NMR spectroscopy as a tool to analyze the structures of their synthesis products. The students can also use NMR in addition to IR to solve the unknown organic compounds when they do their qualitative organic analysis work. The students like to use the Spinsolve spectrometer as it is fast and quite easy to use. For teaching staff, one advantage of the Spinsolve is that it requires very little maintenance and does not require cryogens nor require much bench space. The level of success is reflected in that even some of our researchers have used the Magritek system to look at their reaction products. we are indeed very happy with the experience we’ve had so far with your instrument. We tried to use it as much as we can in our training, and we had the opportunity to offer access to the machine to other students (from highschools and french “preparatory classes” ie 1st-2nd year of academic studies).The ENS Lyon offers a specific training to its students who envision becoming future university teachers. This training involves a lot of laboratory classes. During these classes, our students are requested to present and discuss a variety of synthetic and analytical techniques in front of a jury. So far, for obvious technical reasons, NMR was not routinely available for such presentations. The purchase of the Spinsolve system has been a great improvment in this framework. It has opened new perspectives in the construction of these presentations, and consistently enriched the ensuing discussions (about the nature of the magnet, the information we get from the spectrum regarding the nature and purity o fthe sample, and the main spectral differences obtained as compared with the larger fields cryomagnet spectrometers they have been used to during their internships in research laboratories) . The fact that it can be purchased as an affordable price and virtually no maintenance cost is ideally suited for a teaching department, were running costs are sometimes difficult to handle! Dr Michael King is Chair of the Department of Chemistry at GWU, a private, coeducational research university located in Washington DC. 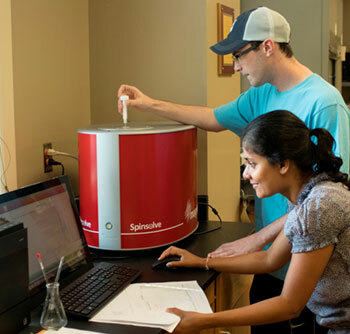 The Department has two benchtop Spinsolve NMR spectrometers from Magritek for the physical/analytical chemistry and organic chemistry laboratories. In Dr King’s class, it is used for quantitative organic analysis. 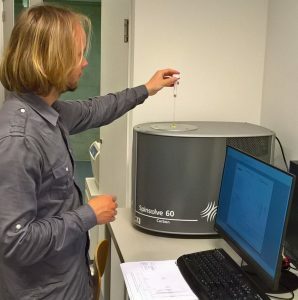 The experiments performed by his students utilize the basic 1D proton mode; loading samples, obtaining spectra and then use the MNova software to clean up and analyze the resultant data. Every year about 160 students at GWU take this class, with each practical lab session having around 14 students. In the lab class each student is provided with solid and liquid unknowns and they have to determine from spectroscopy (NMR, IR) the structure of both. “Students used to miss the link from theory to practical use. Now my groups can have a hands-on experience and understand the value of NMR to the synthetic chemist. Students are taught the basics of NMR and in small groups work one afternoon with the Magritek 60 MHz NMR. 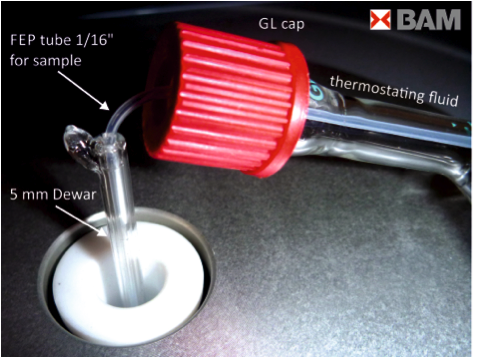 They analyse the alcohol content of various liquors (quantitative NMR). In the same course, students also isolate some products (anethol, piperine, xanthorrhizol) and can then measure their own product to evaluate the identity and purity. In addition to the 60 MHz spectra, 400 MHz spectra are handed out. Immediately after this course, there is an organic synthesis course where students synthesize products. Again afterwards, they assess how successful their synthesis was. So they apply the knowledge acquired earlier. In the 45 years before the acquisition of the Magritek, we used our research NMR (60 ? 90 ? 200 ? 300 ? 400 MHz) for teaching purposes. However since our move to a new lab and the sharp increase in the number of students, this has become logistically impossible. However we did not wish to lose the hands-on aspect and we like students to measure their own products. Therefore, we had to find an affordable alternative solution, i.e., an instrument with a low-field permanent magnet. Although the field strength poses a problem (we can no longer use certain compounds as the spectra are too complicated at 60 MHz), we chose 60 MHz. We tested four different table top low-field NMR instruments, and the Magritek came out best in terms of line width, sensitivity and ease of operation. The price was in the same range as the other instruments so we bought the Magritek. The Magritek also allows for all 2-dimensional (2D) NMR spectra but so far we have not used this option as the introductory course does not deal with 2D NMR. However it is possible, that we will use this option in one of the more advanced NMR courses.